If you follow 90s-nostalgia news, then you already know that a new Silkworm documentary was released last week. Directed by Seth Pomeroy, Couldn't You Wait? The Story of Silkworm pretty much kills it as far as rock docs go. This documentary is classy—it chronicles the indie-rock band's career, from 1987 to 2005, without the VH1-esque rise-and-fall sensationalism. While there is drama, the movie focuses steadily on unfolding the story of the band and their genuine love of music. It also reflects on times when indie labels held exciting possibilities, and when a band that was so obscure, with songs so weirdly imaginative they would never translate to the mainstream, would still have a profound impact on its fans. If your 90s-nostalgia habit falls in the more specific subgenre of 90s-nostalgic Chicagophile, this movie is full of tiny pleasures. The film opens with footage from the 2006 Touch & Go Hideout Block Party, there's some Empty Bottle show footage, and interviews with members of some of your favorite Chicago indie-rock bands like Dianogah, Wilco, and Seam. And maybe you think Steve Albini is a smartass—but the film reveals his true character with some endearing moments and his generosity in helping a band when he recognizes its importance to our sonic history. The tragic death of drummer Michael Dahlquist, along with local music community members John Glick and Doug Meis, is honored with a respectful balance of fact and emotion. While the subject could have been treated with doom and gloom, Pomeroy depicts the tragedy with honesty, displaying the quiet melancholy and heartache felt by those who knew Dahlquist. I don't want to spoil the ending, so I'll just say that Pomeroy's choices and timing make the closing footage beautifully heartbreaking. 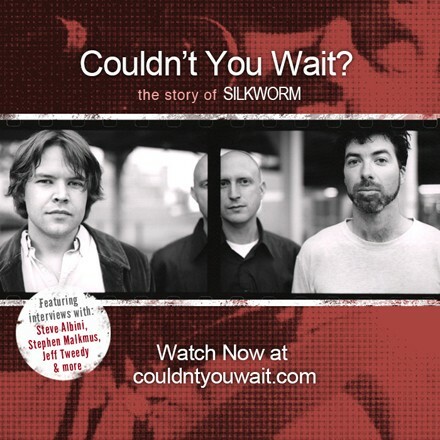 Even if you've never heard of Silkworm but you enjoy music documentaries, get the movie for five bucks. Totally worth it. If you're a superfan, the "Absolutely Everything" package includes live show footage, deleted scenes and quotes, song discussions, a tribute to Michael Dahlquist, and a short documentary called What Is "Indie Rock"? It's all available to download here.